Artificial Intelligence is becoming more commonplace in our everyday lives, and we’re all comfortable with AI as consumers because there is very little for us to do or setup. But with the advent of Salesforce Einstein, Salesforce professionals are confused on what exactly Einstein is. They are also concerned that they will need to know the ins and outs of Artificial Intelligence to leverage its capabilities for their organizations. Salesforce Einstein seems like a black box that is difficult to open. 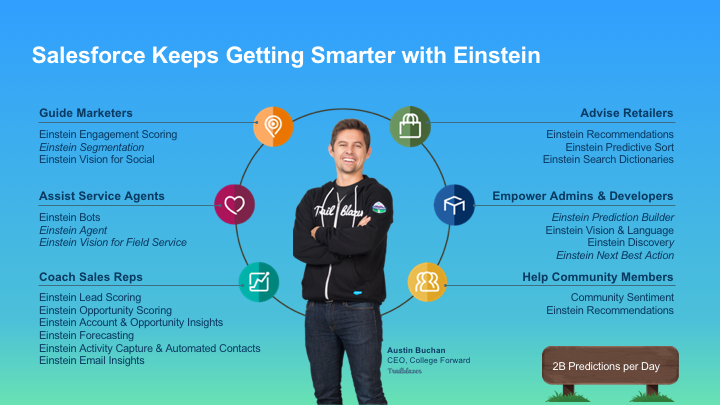 I recently had the opportunity to attend a one-day Einstein Summit for Salesforce Partners in San Francisco which helped to demystify Einstein for me. While I won’t profess to be a Salesforce Einstein expert, I have a good sense of what all is in the platform, and how it works (big picture style). 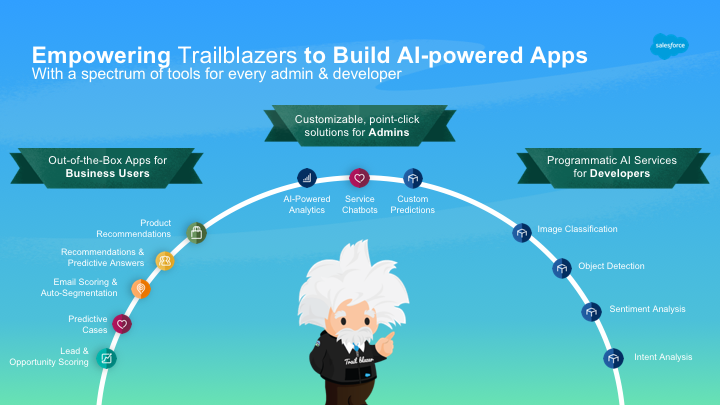 Since the summit helped me so much, I wanted to share some of the insights shared and my “ah-ha” moments to demystify Salesforce Einstein for you too hopefully! First and foremost, Einstein is not a tool to replace employees! There tends to be a fear across organizations that implementing AI will be at the cost of jobs. This isn’t true. Einstein is a really smart assistant. Its goal is to surface information to a user that will help them make better decisions or take specific actions at the appropriate time based on data. Think, Microsoft’s Clippy, but far more useful! Einstein products are also not all “plug and play” products. Some of the out-of-the-box solutions we’ll cover late are, but even these solutions require that the AI models are trained using data. All elements of Einstein need some level of training so that the models can produce accurate results so there can be a significant level of effort to get Einstein up and running (again, depending on the product). 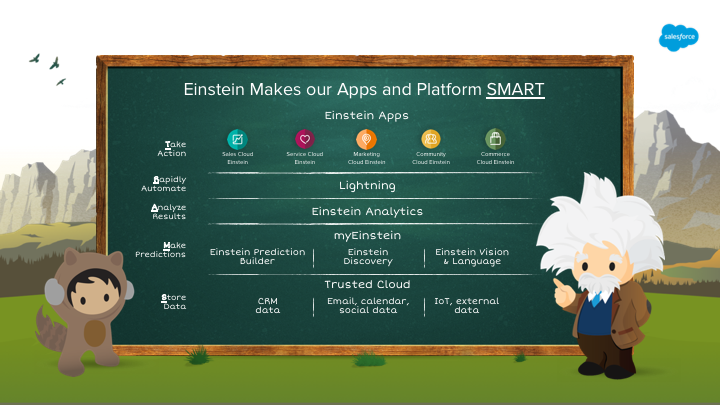 Salesforce is positioning Einstein as Artificial Intelligence for CRM. Einstein is not meant to be and is not being positioned, as a “global” AI tool. For example, Einstein is not going to compete with the likes of IBM’s Watson. Instead, Einstein is meant to work within the context of your CRM and data and related data sources (like an integrated ERP or central data layer) to provide relevant insights and functionality to the users of CRM. Sales reps need help to focus on the right deals and prioritize their day. Customer service reps are looking for help around case deflection, knowledge articles surfaced, and other intelligent recommendations. Marketing – engaging the customer – group segments using Einstein based on who is likely to unsubscribe, click through, etc. Most retail companies can’t deliver on Commerce AI, so there is a significant opportunity here. IT is looking for ways to increase intelligence around help desk and other areas of their applications. There are some benefits to Einstein. But, once the vision has been sold, a whole new set of questions open up! Like, is Einstein a Platform, or a Product and how is it purchased? To answer the question, yes! Einstein is both a Platform and Product. Actually, it’s something like 32 products (which is part of the overall confusion about Einstein, but we’ll get into that later)! 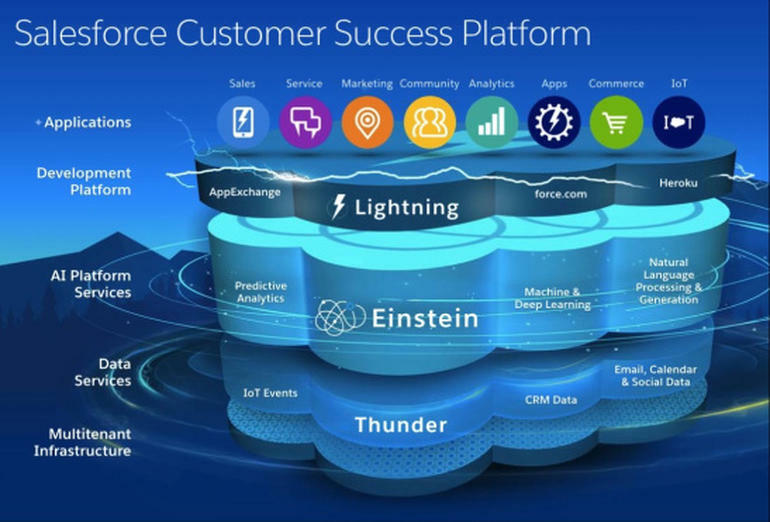 You’ve probably seen this image of the Salesforce Platform before (which I think they have rebranded the “Lightning Platform” or something seemingly catchy like that). You can see that Einstein is already a part of the Salesforce platform for all clients which means that it’s just a matter of purchasing the right toolset. So, this is why I say that it’s a platform. If we were to drill into the Einstein AI Platform Services level of the Salesforce platform, it would look something like this next image. If you start at the bottom of this image, you’ll see how the positioning of AI for CRM makes sense. The data Einstein is using is stored in CRM data; Email, calendar and social data; and IOT and related external data – proving the point that Einstein isn’t a “global AI” tool. As you move up the Einstein Platform hierarchy, you start to see Einstein products referenced, like myEinstein and Einstein Apps. These layers are a bit confusing in and of themselves, but I think that this image does a better job of communicating the main product buckets better than the platform image. I’ll talk about the out of the box apps in more detail, but know that these are pre-built solutions that an Admin turns on in the Org. Once on, Einstein runs through thousands of models using the data in your CRM to provide things like Lead Scoring. There are out-of-the-box apps for each Salesforce Cloud (Sales Cloud, Service Cloud, Marketing Cloud, Commerce Cloud, and Community Cloud). The point and click solutions represented in the middle of the image require some model creation and training, but are fully configurable by a System Admin. In this bucket, you have things like the Einstein Prediction Builder which allows you to answer questions of likelihood such as, “What’s the likelihood that this reservation will be a no-show?” or “What’s the likelihood that this case will be escalated?” The business can then take the score and make decisions with it. Last is the programmatic bucket of products, and this is where Salesforce’s deep learning and neural network products come into play – super geeky stuff over here! This is the area of Einstein that works with all unstructured data, such as voice, language, and images. Because the data is unstructured, these solutions require extensive model training through the API (hence programmatic), but it does some cool stuff. For example, you can train Einstein to identify specific products on a store shelf with a simple picture! The one thing that I heard at the Einstein Summit repeated is that Einstein is not a one-size-fits-all solution. What I mean is that you’ll need to work with your Account Executive, and probably an Einstein Solution Engineer to learn about your use cases and propose a product or series of products. This is perhaps the most challenging part of the Einstein acquisition process. Use cases need to be identified and defined so that the correct products can be purchased. Use cases are also crucial for understanding how to create and train your models (if using a configurable or programmatic solution). Perhaps this is my naïveté, but I didn’t realize how much thought needs to go into building the use cases and models to prevent things like bias and false positives. So, where should your organization start? I think most organizations will start with out-of-the-box apps. These apps require no model training (it all happens in the background automatically) and would provide relevant insights to your users. The image below shows some of the products that are available within each of the out-of-the-box apps by cloud solution. Each out-of-the-box app is sold as a per user per month add-on to your Salesforce licensing, so get in touch with your Account Executive to learn more about what’s included, if the solution fits your organizations use cases, and for pricing details. It’s important to note that even the out-of-the-box apps require specific standard fields and objects to be used, and a specific amount of data in those objects to process the underlying models. If your organization doesn’t meet the minimum data requirements, Einstein probably isn’t a good fit for your organization right now. Remember, Einstein is looking for trends in the data so that it can make accurate recommendations. If the right volume and data points don’t’ exist, it can’t make the recommendations. For the Sales Cloud Einstein out-of-the-box app, Salesforce has provided a readiness assessor tool which evaluates the org to determine if Einstein could be used based on your current configuration and data points. Much like the Lightning Readiness Check or the Salesforce Optimizer Report, this Einstein Readiness Assessor will evaluate your org and provide a report in PDF form that outlines what may need to be fixed to use Sales Cloud Einstein. To run the Einstein Readiness Assessor, navigate to Setup and in the Quick Find box type “readiness assessor.” After you’ve run the report, take some time to review it and determine if Einstein is a good fit for your organization. If you think it is, contact your Salesforce Account Executive to get the ball rolling! I’ve created a custom Trailmix just for you! This should help you get started with Einstein and learn about the features and benefits of the AI platform! What do you think about Salesforce Einstein? Is your org using it, or are you evaluating it? Have additional questions? Leave a comment below – I’d love to hear what’s on your mind! You need a proofreader. I’ll volunteer. Hi Sara! Thank’s for the feedback. I sometimes get so excited about my posts that I forget to go back and review them in detail before publishing. I have reviewed and updated the post. I’ve fixed a number of errors. Thanks for reading! I hope you found the post useful! Brent, the Grammarly browser extension has helped me a lot with fixing errors on-the-fly before I mistakenly send out an email or make a post public that has glaring errors. So much so, that I subscribed to the premium version. (Sorry for the plug – I don’t work at Grammarly). That said, thanks for posting this and creating the custom trailhead. Einstein, for me at least, was in sore need of demystifying! Thank you, Chris! I hope to publish more on the topic in the future!